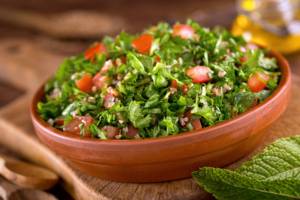 Chop the parsley and place in a large bowl, along with the tomato, onion and hemp seeds. In a small blender, or whisked by hand, combine the lemon, garlic, olive oil and sea salt and blend or mix well. Pour over the salad and toss well. If this recipe made your mouth water…subscribe to our Monthly Newsletter to receive more recipes, health tips, and natural medicine news updates.